The bioscience sector is gaining critical mass and attracting top researchers and new industry to the state. BIO Alabama is the trade association that represents the biosciences industry across the state. This includes life sciences and biotech from the institutional and industrial sectors. In March, several representatives of BIO Alabama met with state representatives, state senators and the governor’s office in Montgomery to report on the state of the industry. The biosciences support jobs in research, manufacturing, distribution and clinical services. Companies and institutions are making advances in genetic engineering, clinical genome analyses, medical device design and manufacture and bio-materials. Clinical applications include pharmaceutical and supplement manufacture and distribution, and many health-related disease solutions and research. 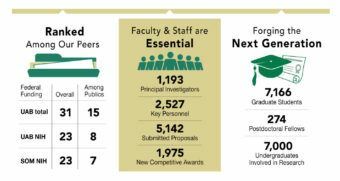 We reported to the Legislature that the industry was growing, greater amounts of research funding were entering the state, and a strong level of collaboration was occurring throughout the research institutions. Research labs are tackling high impact areas, such as cancer drug therapies, protein engineering, neurodegenerative diseases, implant bio-materials and big data solutions. 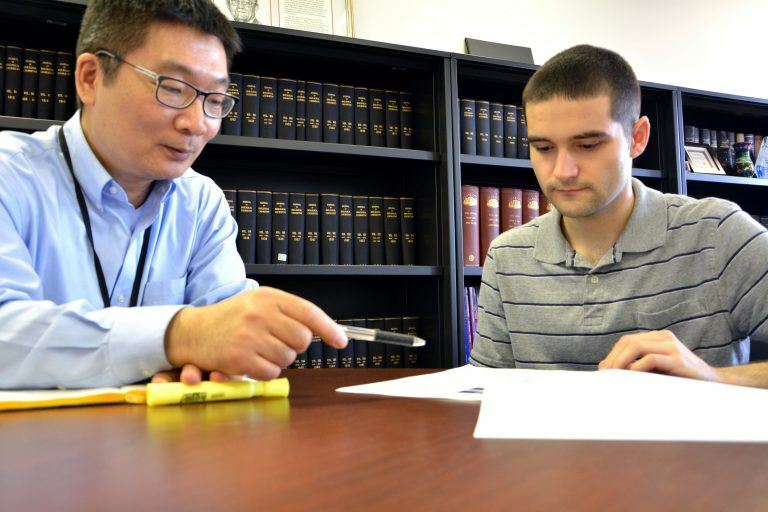 Applied research is active in health analytics, a growing field that promises to reduce health costs by analyzing rates of disease, behaviors towards therapies and trends developing in urban and rural areas. Commercial companies in Alabama are manufacturing drugs and supplements, producing drug delivery products, and designing new medical devices and diagnostic tools. The services sector includes clinical design studies, precision medicine, custom therapies, personalized medicines, health IT, drug design, diagnostics, genome lab services and the state’s first genome clinic. Today it is possible to enter the start-up field in biosciences without a huge investment. Many applications are available using DNA tools, wearables, apps and databases that are easy to procure. The field is ripe for innovation from products to physician services. Start-up funding is available from multiple angel investment groups, Alabama Launchpad, university innovation grants, venture capital and SBIR and STTR funding. BIO Alabama is connecting the bioscience ecosystem to smooth the access to capital and mentors. Legislators were eager to hear about new discoveries and growing exports from the bioscience field. Georgia, Tennessee, South Carolina and Florida have very established bioscience trade associations and the benefit of industry consolidation around large cities. Alabama has more of a challenge in that the bioscience industry is spread throughout the state with several growing centers. This is an indication of the health of the industry but it makes it more difficult to gain collaborations and build cluster traction. That’s where BIO Alabama comes in — developing and encouraging networks to accelerate new business ventures. 1. Birmingham is the most mature with top research centers at the University of Alabama at Birmingham (precision medicine, oncology, drug discovery and genetic studies) and Southern Research (infectious disease, drug development, neuro-degenerative disease). A vibrant start-up culture exists with funding available from several capital networks and established venture groups. Start-ups are launched at the Commercialization Accelerator at UAB’s Harbert Institute for Innovation and Entrepreneurship, Innovation Depot and others. Commercial firms in Birmingham include Evonik, Avanti Polar Lipids, Biohorizons Implant Systems and Oxford Pharmaceuticals. 2. Huntsville is home to HudsonAlpha Institute for Biotechnology, a public-private partnership that brings research (genetics, genomics, bio-informatics) and over 35 for-profit companies (precision medicine, diagnostics, drug discovery, biotech services) together. Additionally Nektar operates a facility supporting drug development with new chemistry approaches. The University of Alabama in Huntsville is exploring plant and protein sciences and Alabama A&M is active in plant research. NASA’s operation at the Marshall Space Flight Center has funded biotech experiments and research on the International Space Station — one of the U.S. National Labs. 3. The Auburn-Opelika area is a hot bed of research from Auburn University, specializing in genetics, biomaterials and drug discovery, along with corporate and manufacturing facilities for SiO2 (medical products), Baxter (dialyzer production), Vitruvias Therapeutics (injectables) and Pharmavite (high quality vitamins). 4. The Montgomery area is represented by two universities, Tuskegee and Alabama State, as well as commercial endeavors Steris (medical equipment manufacturer) and Kowa Pharmaceuticals (pharma products). 5. In Tuscaloosa, the University of Alabama is active in drug discovery and protein engineering, as well as new activity in health IT. 6. Mobile is represented by the University of South Alabama where fusion protein therapeutics and personalized medicine are being researched and spin offs are encouraged through the USA Coastal Innovation Hub, a high-tech business incubator. Mobile is also a landing spot for new businesses at the Innovation PortAL, a public-private entity for early seed and start-up opportunities. Swift Biotechnology, located at USA’s Mitchell Cancer Institute, is developing early detection techniques for cancer diagnosis. BIO Alabama supports Southeast BIO (SEBIO) and Southeast Medical Device Association (SEMDA), organizations that help build bridges to industry and research in our region. The biosciences are thriving in Alabama. We are in the top 20 percent of the country for bioscience share of total R&D expenditures. Start-ups are popping up across the state. New intellectual property is coming from the institutions and industry is growing and hiring graduates from our state institutions. The bioscience sector is gaining critical mass and attracting top researchers and new industry to the state. State legislators see this industry as a high value and growing contributor to the state economy. Treatment usually involves surgery, chemotherapy and radiation, but the cancer tends to recur months later.Glioblastoma multiform (GBM) is an aggressive brain cancer, and its cause is unknown. The median survival rate for patients being treated for glioblastoma is 14.6 months, with a low rate of survival beyond five years, according to the American Brain Tumor Association. Huntsville, Ala. — HudsonAlpha Institute for Biotechnology’s Educational Outreach team is bringing its popular genomics teacher training to a national audience. For the first time, the professional development workshop, Genetic Technologies for All Classrooms (GTAC) will be offered to teachers across the country. GTAC is a five-day academy for educators that is in its eighth year of training Alabama Life Science educators. Thanks to the generous support of corporate and individual donors, tuition is reduced to $1,100. Tuition includes 40 hours of professional learning credit, housing, meals and $800 worth of HudsonAlpha kits, materials and classroom resources including Disorder Detectives, Collecting Cancer-Causing Changes (C4) Kit and Genes & ConSEQUENCES. “I was totally blown away by my week at GTAC,” said Lori Roberts, an AP Biology teacher at Muscle Shoals High School. “The labs are engaging and current, and I was so excited to hear what the scientists at HudsonAlpha are doing. Their research is breaking new ground in terms of human health and agriculture. I left GTAC with a renewed zeal and love for genetics.” Roberts attended a GTAC workshop last summer. Loftin and members of the Educational Outreach team will share information about GTAC: National and other innovative programs for educators at the National Science Teachers Association (NSTA) conference March 15-18 in Atlanta, Ga., at booth 1104. In addition, Neil Lamb, PhD, vice president for Educational Outreach, will do a presentation for teachers at the conference Saturday, March 17 at 8 am. Lamb will discuss the top biotech discoveries of 2017 and share ways to bring the ‘’too new for textbooks’’ discoveries to the classroom using student-friendly language. Session attendees will receive a free copy of HudsonAlpha’s 2017 Biotechnology Guidebook. “The field of biotechnology is continuously changing so my presentation at NSTA will give educators a preview of what to expect at GTAC: National,” said Lamb. GTAC: National will take place July 23-27 at HudsonAlpha. To learn more and register, visit hudsonalpha.org/GTACnational. 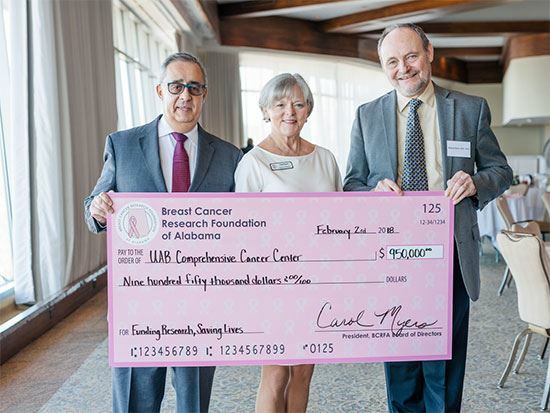 The Breast Cancer Research Foundation of Alabama presented $950,000 — its largest donation to date — to the UAB Comprehensive Cancer Center on Feb. 2. 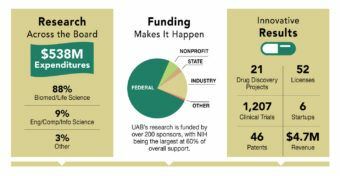 BCRFA has donated more than $7.7 million to UAB since its inception in 1996. BCRFA makes an annual donation to the Cancer Center with proceeds from its fundraising efforts during the previous year, including BCRFA events, corporate and individual donations, and sales of the breast cancer specialty license plate tags. BCRFA’s pilot funding has provided the seed money for many projects to get off the ground. For example, one research project evaluated a new compound, UAB-30, for its ability to prevent breast cancer. The project has evolved now into a clinical trial and, furthermore, secured additional national funding based on data provided by BCRFA seed money. Other projects range from examining biomarkers for immunotherapy response to focusing on inhibitors and their impact on chemo drug effectiveness, to a study on the spread of metastatic breast cancer to the brain. “Patients come to the UAB Comprehensive Cancer Center because they can be seen by clinical breast cancer experts and receive ‘cutting-edge’ therapies based upon the ongoing research program,” Birrer said. All BCRFA donations remain in Alabama to support research at the UAB Cancer Center and its collaborative partners, providing a lifesaving impact both locally and globally. Community partners for this year’s gift include Tameron Automotive, Belk, The Thompson Family Foundation, Sirote & Permutt, The Alabama Power Foundation, Renasant Bank, Wind Creek Wetumpka, Protective Life Foundation, Thrivent Financial, Spectrum Reach, and iHeart Media, among many others. HudsonAlpha researchers will join leading genomics experts at the Advances in Genome Biology and Technology (AGBT) meeting in Orlando, Fla. February 12-15. AGBT is a genome science and technology conference where top researchers, leaders and innovators collaborate and discuss new discoveries in genomics, advances in DNA sequencing technologies and more. The meeting format includes daytime plenary sessions featuring invited speakers and abstract-selected talks that highlight cutting-edge research across the broad landscape of genomics. AGBT also will feature evening concurrent sessions about experimental and computational approaches for effectively utilizing the latest DNA sequencing technologies. To learn more about AGBT, visit http://www.agbt.org/.